Being able to accurately diagnose your pet’s medical condition sometimes requires more than just bloodwork. Veterinarians must be able to “see inside” your pet in order to diagnose and fully understand what is causing him or her to be sick. At Avets, these imaging modalities include ultrasound, CT scans, and MRI. The veterinarians and veterinary specialists at Avets are then able to use the information gained from these imaging studies to determine the best course of treatment for your pet. If that course of treatment involves surgery, the surgeons at Avets will discuss the best surgical option(s) for you and your pet. In order to shorten recovery time and improve patient comfort, minimally invasive surgery may be an option depending on your pet’s medical condition. Ultrasounds use sound waves to create images of the inside of your pet. 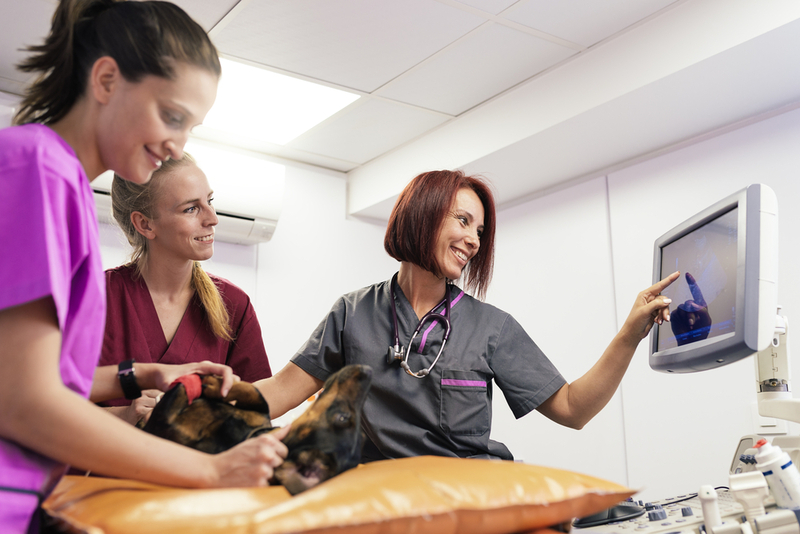 At Avets, our ultrasound technicians have been trained in human medicine, but have also received additional training from a board-certified veterinary radiologist. Most ultrasounds can be performed while your pet is awake, however a mild sedative may be given if needed. At Avets ultrasound is used to diagnose a variety of medical conditions, including tumors affecting the organs inside the abdomen, foreign bodies, pancreatitis, gastroenteritis, kidney disease, and liver disease. CT scans, also referred to as CAT or Computer Axial Tomography scans, are essential in helping evaluate and diagnose certain illnesses and injuries in dogs and cats. For certain diseases, a CT scan provides a more detailed description and is a better option than an ultrasound. A CT scan is performed while your pet is under heavy sedation or anesthesia to prevent them from moving and disrupting the scan. At Avets a CT scan is used to diagnose conditions affecting the spinal cord, chest cavity, abdomen, and head/skull. The information gained from the CT scan is then used to help develop a treatment plan for your pet. MRI, which stands for magnetic resonance imaging, helps veterinarians evaluate your pet’s brain. It may be recommended for pets suffering from seizures or abnormal mentation/personality. An MRI must be performed under general anesthesia to make certain your pet remains absolutely still. At Avets an MRI is used to diagnose various conditions affecting the brain, including tumors or inflammatory diseases (such as meningitis). Often times an MRI is performed in conjunction with a cerebrospinal fluid (CSF) analysis. When it is necessary for pets to have surgery, there are some procedures that can be done in a minimally invasive manner. This can lead to a faster recovery time, decreased post-operative pain, improved visualization, and smaller incisions. The surgeons at Avets offer laparoscopy and arthroscopy as minimally invasive options for your pet. Laparoscopic surgery allows surgeons to look inside your pet’s abdomen with smaller incisions instead of a single large incision used in a traditional “open” surgical procedure. Laparoscopic procedures available at Avets include liver biopsy, ovariectomy (i.e. a spay), prophylactic gastropexy, and cryptorchid castration. Arthroscopy allows surgeons to look inside your pet’s joints. While smaller incisions are made with arthroscopy just as with laparoscopy, the real benefit of arthroscopy is the improved visualization of the inside of the joint. The surgeons at Avets performed arthroscopy of the shoulder, elbow, and stifle (knee). Arthroscopy can be used to treat OCD lesions, medial coronoid disease, and meniscal tears and can be used to evaluate the cranial cruciate ligament. Avets is proud to provide specialty and emergency veterinary care to the pets of western Pennsylvania. If your pet requires advanced veterinary care, please contact us at 412-373-4200. We are located at 4224 Northern Pike in Monroeville and are open 24 hours a day, 7 days a week.